Ultrasonagraphy is an exellent non-invasive way to see internal structures in real time. It uses high frequency sound waves to image structures deep inside the body just like when sonagrams are used to evaluate human pregnancies. The transducer will aim a beam of sound that is directed into area, and different tissues will bounce back an echo of this ultrasonic wave. 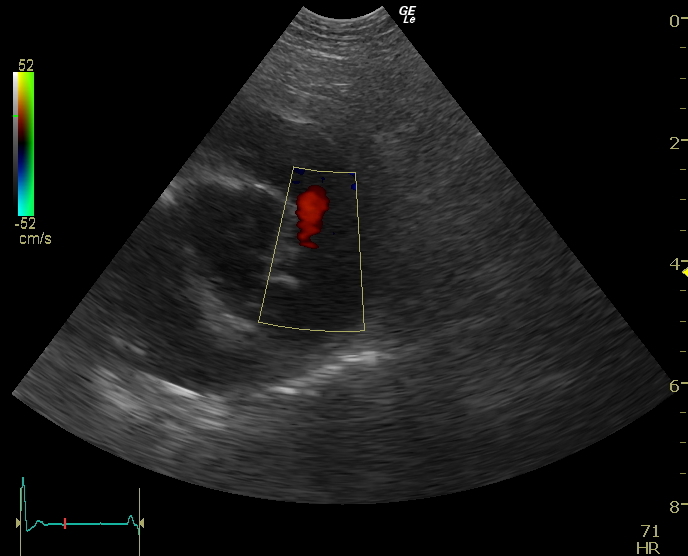 The ultrasound machine will record the reflections of these echos of this ultrasonic wave and interpret them into a readable image. Liquid or any fluid provides a very black non-reflective image because all the sound keeps going through it with a minimal echo so the machine colors it as black (hypoechogenic). Air, however, reflects all the sound and is printed as white or very bright (hyperechogenic). This often allows a quick diagnosis, and in the cases of hearts (specifically called echocardiograms) to evaluate the actual function of the heart muscle and the workings of the four heart valves. Radiographs (x-rays) take the three dimensional object of the body and creates a flat 2-D image. Organs and bones are imaged on top of each other so perpendicular views are taken for an accurate interpretation. This gives very good information, especially for the size and shape of organs and bones. Ultrasonagraphy takes this a step forward in allowing an inner view of the organs' structure. These two modalities complement each other in allowing us to reach an accurate diagnosis and assessment of a pet's disease. As one can imagine, it takes many hours of formal training as well as hours of scan time to reach a level of compentency in interpreting these images. Dr. Maness has used ultrasonagraphy as a practioner in a basic manner since 1998, but has undertaken intense formal training since 2005. Up to January 2009, she has obtained 379 formal hours of continuing education by Sound Technologies of which 192 hours have been specifically in echocardiograms. Dr. Maness is considered an advanced sonagrapher and can interpret most studies in house. 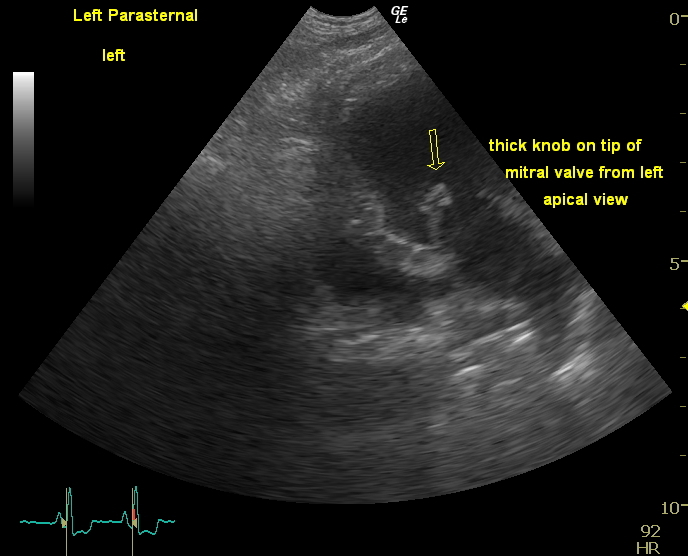 She can also obtain ultrasound guided biopsies to assist in diagnosis is necessary. Dr. Maness uses a Logiq e machine. This is considered a very high end ultrasound machine which means a better quality of image is obtained. This machine is also a benefit of being small enough to be mobile so Dr. Maness can obtain and interpret studies for surrounding veterinary and emergency clinics . However, she is also set up for telemedicine so these images can be sent out for telemedicine to a board certified specialist (internist or cardiologist) for consultation. Some cases can also be posted on the Veterinary Information Network for other veterinarians' opinions on unusual cases. ♦ Encourage drinking water (unless anesthesia is scheduled). ♦ Expect the entire belly to be shaved for an abdominal study (the hair traps air and can interfere with the study). This procedure can take some time. and the final interpretation and measurements may not be available until the next day. 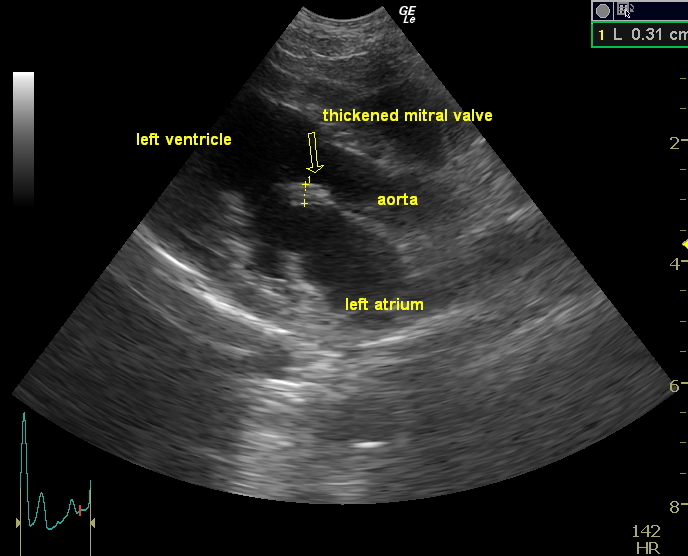 A Ao endocarditis_ L A_2 D Heart beating with visible aortic valve damage.